iT'Z Family Food and Fun is 60,000 square feet of family fun. We offer 6 attractions: 2 story laser tag, 3 story rock climbing wall, mini-bowling, bumper cars, laser maze and atomic rush. 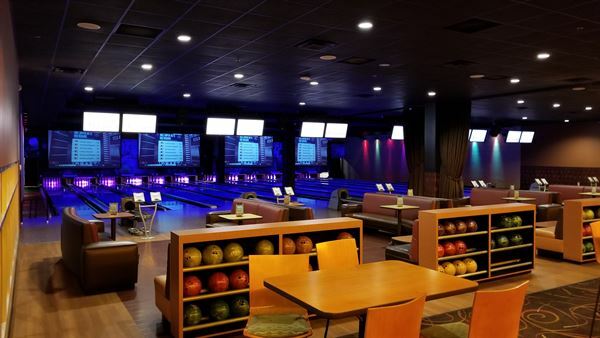 We also offer 150+ video games plus full size bowling and full bar service. We also offer a full unlimited pizza buffet and unlimited soft drinks. This last December my staff and I had our meeting at It'z Family Entertainment Center. It'z is a 60,000 square foot facility that has indoor go-karts, laser tag, bumper cars, mini bowling and many arcade games. They have three large conference areas that can accommodate around 100 people per room and then eight smaller rooms that can each accommodate twenty-five people. The room we chose held seventy-five people comfortably. It was set up with HD TV's and a large projector that was all plug n play, which was great for plugging in my laptop. They are a buffet style facility which was great for our company since we were on a budget. They had pizza, pastas, salad, and deserts. I loved their Dragon Fire Chicken Pasta!! After our meeting we were able to enjoy ourselves throughout their facility with a few team building activities. We had Team challenges with laser tag and Mini bowling and some individual speed and time challenges in go-karts. We also had a ticket challenge where we play all the games in the game room and tried to see which team could rake in the most. After all the competitions concluded we had an award ceremony back in our conference room where certificates were given to the winning teamsâ€¦even the losers got an award. Don't tell the boss but they even have beer and wine and for a little extra charge they will set up a full service bar in you room. Easy to say we had a great time and the management and staff took very good care of us. We have already booked our next stay at It'z. Special Moments located at the Historic Round Grove Chapel in Lewisville is the perfect place for a wedding, reception, special occasion, or corporate event. Our Chapel & Reception Hall can accommodate up to 100 guests. We are passionate about making sure any event we assist with flows as you have planned. Whether you need advice, or need us to be there for you throughout the event, give us a call. Our professional Consultants and Coordinators are glad to help however we can. One of the best features of Special Moments is its on-site reception hall, which presents a smooth transition from the marriage ceremony to the ensuing celebration. We supply everything you need for a traditional cake and punch reception, and are happy to provide assistance for a more elaborate festivity. Because of our long history amongst Dallas wedding locations of conducting marriage ceremonies, Special Moments has many connections with local vendors and can put you in touch with those that meet your service needs. Experience the BRAND NEW Crowne Plaza Hotel Dallas Market Center and find yourself in a stunning hotel conveniently located 3 miles from Cedar Springs Alternative Entertainment District We are offering a special pride rate for our deluxe rooms. We are 5 miles from downtown Dallas near the market and design district which includes the World Trade Center and Market Hall. The Crowne Plaza Market Center is centrally located within five miles from the Dallas Medical District which includes UT Southwest Medical Center, The Aston Center, Scottish Rite, Parkland, St. Paul, Children's Hospital and Zale Lipshy. The Crowne Plaza Dallas Market Center Hotel is located six miles north of the American Airlines Center, home of the Dallas Mavericks and Dallas Stars. If coming in for an event please call and ask for the American Airlines Center Rate.In addition, the Crowne Plaza Dallas Market Center Hotel is located within minutes of Texas Stadium, home of' America's Team' the Dallas Cowboys. If needing to rent a car while in town please contact EZ Car Rental which is located our lobby. We look forward to your visit.